In a tumultuous year defined by strife and division, this fish remained a steady and reassuring presence. 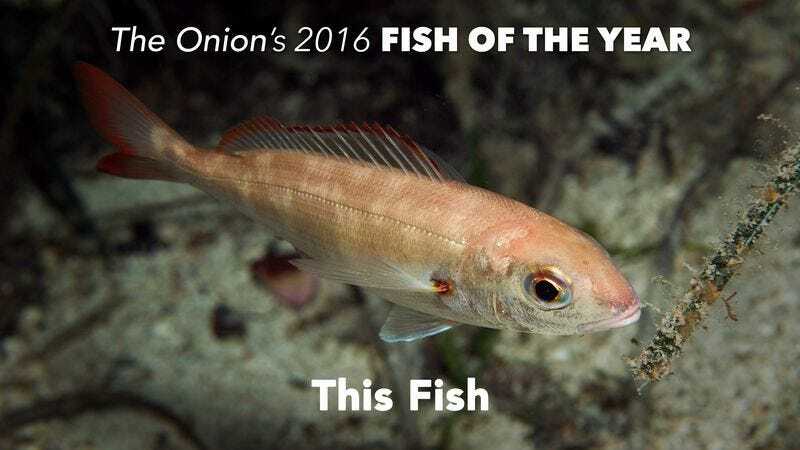 Every 12 months, the editorial board of this newspaper convenes to select the recipient of our highest annual honor, and indeed, one of the most esteemed and renowned prizes in the world of journalism: The Onion’s Fish of the Year. The members of our selection committee do not take such a task lightly, and this year, as in all others, they closely and carefully evaluated the many available candidates on a wide variety of criteria, respecting the full weight of the accolade they were entrusted to bestow. Sometimes our honoree is chosen based on its prominence in that year’s news cycle. Other times, a Fish of the Year is selected because of its ability to inspire or to bring about meaningful change. This year, The Onion’s editors began their deliberations by asking one simple question: Which fish, among all others, embodied the tone and spirit of 2016 as no other fish could? The answer was unequivocal. That’s why, for the year 2016, The Onion’s Fish of the Year is this fish. While at 6 inches and 12 ounces this axillary bream might seem at first an unassuming choice, it’s this fish’s quiet dignity and resilience in the face of aquatic turbidity that secured its spot as this year’s most influential. Indeed, on matters of filter feeding, scale luster, and avoiding predation, this freshwater fish clearly stood above all others. It should be known that our editorial board made its decision well aware that it was likely to be controversial. When selecting a single winner out of trillions of potential candidates, one could argue that any choice is bound to incite heated debate. Some will no doubt argue that this year’s winner is a repeat of 1954’s contentious Fish of the Year selection, when The Onion chose a relatively unknown haddock over a much more prominent 140-pound wels catfish. Others may even find this year’s winner as divisive as our bold and conceptual selection in 2006, when we notably named You, The Reader as the recipient of our annual award. However, our selection committee is confident in its choice. After evaluating individuals from over 30,000 fish species on categories ranging from swimming speed, to extent of spawning territory, to ability to survive in varying currents and water temperatures, it is our newspaper’s position that there was no other viable option. For many Americans, when they think of 2016, they think of this fish. For those still unconvinced, the editorial board would like to make it known that there is ample precedent for this decision. Consider our famous 1960 pick of an Arctic char as a compromise choice in a crowded and divided field of candidates, or our 1974 selection of a basa fish that so well captured the paranoia and suspicion of the post-Watergate era. Now as then, there were many excellent alternate choices, including a northern pike and an unidentified silver-and-yellow fish that we briefly spotted off the southern tip of New Zealand. But when placed head-to-head with other contenders, our winner proved itself again and again, most notably with its ability to live in waters from West Africa to Northern Europe, its tendency to grow to 7 to 9 inches in length, and its maximum lifespan of 18 years. In short, we believe the choice of this fish speaks for itself. It is our opinion that this year’s fish honors and upholds this grand tradition. And indeed, in these trying and uncertain times, this exemplary bream stands as a noble example of the type of fish we can all admire, if not aspire to ourselves.